Save 6-8 hours a week and do something for yourself! Spend more time with the kids! Go to the gym! Finish projects around the house! Let us worry about the grocery shopping, menu planning, cooking and cleaning the kitchen! Have our professionally trained chef cook for you and your family! Each client can sit down with their chef to completely customize the service and their meals to best suit their family’s needs. Your chef will create a menu, grocery shop, arrive with the freshest ingredients, prepare the meals in your home, package and label them, clean up and present you with simple warming instructions. Dinner for the week is done! All of our chefs are trained and have specialized in cooking for clients with food allergies or who have special diets. Your Culinary Experience, Inc. specializes in allergy free cooking such as gluten free, soy free, dairy free and nut free just to name a few. We focus on heart healthy cooking and purchasing what is fresh and in season at the market. We can cook for your family as often as once or twice a week or as little as once or twice a month! 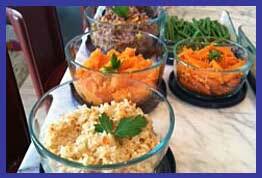 Our packages are based on how many dinners we are preparing for your family during one cook date. Each cook date includes one soup or salad and each entrée comes with two side dishes. Speak to our Executive Chef Danielle Fragala to discuss which package is best for your family. At Your Culinary Experience we want to offer more than amazing meals, we also offer theme party planning and cooking classes. You may contact us at 914-261-4121 for additional information.